Imagine you had to pick one person to represent a certain era. Who would you choose for the 1920s? The 2000s? The 1780s? 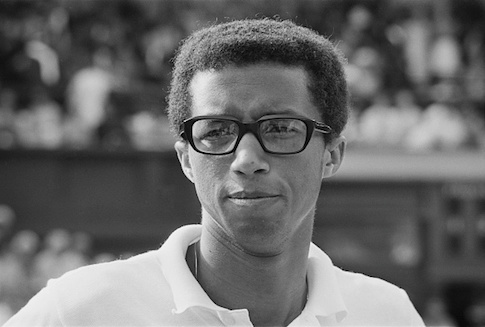 It's an interesting thought exercise, and in Arthur Ashe: A Life, Raymond Arsenault presents a compelling case for why Ashe, more than anyone, lived a life that most reflected his time. A black man coming of age during the Civil Rights Movement, a soldier during the Vietnam War, a leading anti-apartheid activist, a victim of AIDS during the early days of awareness of the disease—at nearly every turn of his life, Ashe was front and center with some of the most important issues facing the nation. It's odd to think Ashe didn't receive the biography treatment earlier. While he wrote four memoirs over the course of his lifetime—his first before he'd even graduated college—each focused on a different time of his life, and curious readers never had a chance to read an all-encompassing work on the tennis great. But no longer, for Arsenault's 629-page behemoth—not including endnotes and appendices—has everything: all the info from the autobiographies, plus stats from his junior career, interviews with family and friends, and facts gathered from every other imaginable source. Arsenault doesn't do anything fancy with his prose—he just presents the facts in a straightforward biographical style. There are moments that will likely bore non-tennis fans, but lovers of the sport will enjoy such details as the history of the American Tennis Association—the alternate tour created by African-American players shunned by the white tennis establishment. While tennis provides the backdrop of the book, it's Ashe's life off the court that pushes the narrative. Ashe's own worldview changed in tandem with American society at large, and much of the book is dedicated to explaining how he went from being a tennis player to an activist who played tennis. Ashe was initially a staunch believer in quietly working within the system to combat racism but later became an outspoken critic and protester. His views on everything from the Vietnam War to feminism shifted—usually to the left—and Arsenault traces how Ashe's ideological moves came to be, careful not to make it seem as though any of these changes were instantaneous. Ashe's ideology was, at times, curious. He was openly liberal, yet an ardent critic of affirmative action. He was tennis's ultimate spokesman for decorum, but was once arrested for protesting outside the White House. He was a fan of Jesse Jackson, but voted for George H.W. Bush in 1988. He was a contemplative man, more interested in who he thought had better ideas than in party affiliation. Arsenault treats his subject objectively and rarely does any editorializing. He lets Ashe's views stand for themselves, with the only judgmental comments on Ashe's stances coming from Ashe himself. If one could only read one chapter of the book, the 25th chapter, titled "Days of Grace," tells readers everything they need to know about Ashe as a man. It's the section of the book that details his life after learning he had HIV, which due to the rudimentary medicine of the day would inevitably lead to AIDS. After being issued what at the time was essentially a death sentence, Ashe soldiered on. He remained politically active, meeting with important black political figures of the day, writing columns for the New York Times, and engaging in anti-apartheid activism. He increased his philanthropic efforts, adding to his already lengthy list of commitments, and undertook a number of business ventures. And when his illness became public knowledge, he used it to teach Americans more about the disease that haunted the public imagination but few actually knew much about. The chapter is Ashe in a microcosm: hardworking and intellectual, kind and generous, loving to his family and, more than anything, wanting to improve the world he lived in. This month marked the 50th anniversary of Ashe's first major tennis triumph—the first U.S. Open where professionals and amateurs were allowed to play in the same field. And this past February was the 25th anniversary of Ashe's passing. With two major milestones from his life occurring this year, interest in Ashe is high and many have taken the time to reflect on what he meant to his sport and to the world. These 629 pages might sound like a pain, but there's no better way to remember Ashe than to read about his life in full.